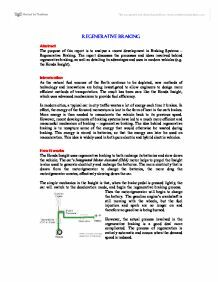 REGENERATIVE BRAKING Abstract The purpose of this report is to analyse a recent development in Braking Systems - Regenerative Braking. The report discusses the processes and ideas involved behind regenerative braking, as well as detailing its advantages and uses in modern vehicles (e.g. the Honda Insight). Introduction As the natural fuel sources of the Earth continue to be depleted, new methods of technology and innovations are being investigated to allow engineers to design more efficient methods of transportation. The result has been cars like the Honda Insight, which uses advanced mechanisms to provide fuel efficiency. In modern cities, a typical car in city traffic wastes a lot of energy each time it brakes. In effect, the energy of the forward momentum is lost in the form of heat in the car's brakes. More energy is then needed to reaccelerate the vehicle back to its previous speed. However, recent developments of braking systems have led to a much more efficient and resourceful mechanism of braking - regenerative braking. The idea behind regenerative braking is to recapture some of the energy that would otherwise be wasted during braking. This energy is stored in batteries, so that the energy can later be used on reacceleration. ...read more. Another advantage of flywheel technology is that the additional power supplied by the flywheel during acceleration supplements the power output of the small engine. A flywheel system in a hybrid car. --> Regenerative Braking and Fuel Cells: The third system uses a unitised regenerative fuel cell (URFC), which is designed to be reversed to take the energy from the wheels, combine it with water, and produce hydrogen and oxygen - allowing it to act as a type of revolutionary battery. The system as a single unit is substantially lighter than a separate electrolyzer and generator, which makes this system especially beneficial when weight is a factor. Also, the system's energy is ten times that of lead-acid batteries and twice as much as any chemical batteries. This means that not only will this technology make lighter hybrids available, but it will also give hybrids a driving range that is comparable to that of vehicles today that are equipped with conventional engines. Further benefits of the URFC is that it will be more cost effective than other vehicles because it will not need to be replaced, and it will provide the additional power needed by an electric engine when accelerating onto a highway. ...read more. The manufacturer and designer of the Insight system, Honda, believe that the regenerative braking system will continue to be used in cars as a system to recapture otherwise wasted energy and store it in a normal car battery. There is also a move by the manufacturers to introduce Honda cars that are capable of using regenerative energy in flywheels (see p.2) and storing it in the URFC (see p.3). 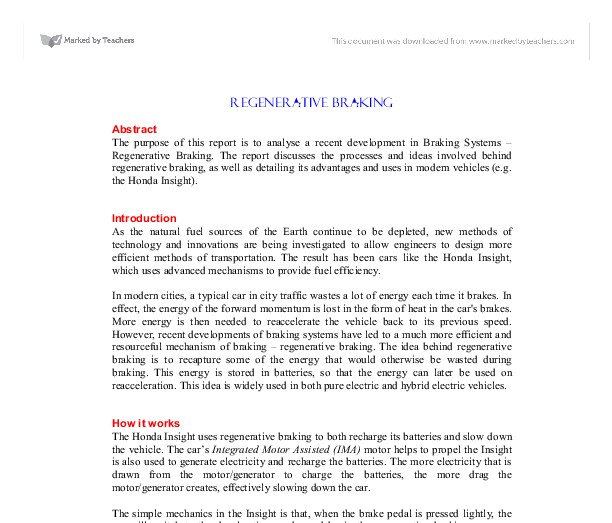 Conclusions The Regenerative Braking system is a fairly recent development in Braking Systems, pioneered by companies such as Honda, and featured in vehicles like the Insight. The system has opened up a new world of possibilities and opportunities for fuel efficiency in peak hour city traffic. As such, it will dramatically cut down on fuel consumption in city areas and result in a much more efficient system of transport, where there is little energy lost as heat every time the vehicle brakes. Suggestions / Recommendations The regenerative braking system is still a new concept. Because of this, the system is not as efficient as it can be. Further research in to materials and designs of the system will enable a progressively more effective system of energy capture. This system can also be customised to suit particular environments (eg. city, rainy weather, country) to help the vehicle recapture as much energy as possible from its particular situation. ...read more. obtained from Fred, unclouded by the interviewee's interpretation of subtle cues on the part of the interviewer. However, on the other hand, though, this rigid structure will not allow potentially interesting lines of inquiry to be pursued or followed up on. Off-the-shelf (OTS) is a term for software or hardware, generally technology or computer products, that are ready-made and available for sale, lease, or license to the general public. They are often used as alternatives to in-house developments or one-off government-funded developments. However, even within the heavy-user group, many heavy users are loyal to existing brands. New-product marketers now aim at consumers who are early adopters. The theory of innovation diffusion and consumer adoption helps marketers identify early adopters. There is a Mechanism in any behavior or act. The deliverables for this stage are a Functional Model and a Functional Prototype that together represent the functionalities that could be realised in this iteration, ready for testing by users. Next to this, the Requirements List is updated, deleting the items that have been realised and rethinking the prioritisation of the remaining requirements. The disadvantage of XML is that it requires conversion to HTML, currently making it unsupported in several browsers. XHTML Extensible Hypertext Markup Language (XHTML) is essentially HTML which also conforms to XML syntax. It is much stricter; documents need to be rigid and well formed. Kabir during the interview. The questions which were asked in the interview and the response from Mr. Kabir are shown below: Q. What is the current system you are using in the store? We currently have no computer system and it is manually based, for storing customer details, orders and receipts. 2) There may be a choice of programs available. 3) They may be viewed before purchase. 4) Opinions of current users may be sought before purchase. 5) The package should be cheaper because the development costs are shared by all the purchasers.